At LAWPRO we take pride in our commitment to excellence in customer service. We aim to provide you – our customers – with products and services that meet the highest standards, and to continually improve relationships with you. If you believe that we have fallen short of this standard, we encourage you to tell us about it. Our complaint handling protocol has been put in place to ensure we identify any need for improvement and continue to provide you with service you have come to expect. 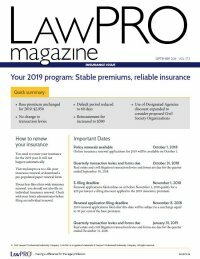 Please try and address your concern with the person currently dealing with your LAWPRO business or issue – for example, a claims examiner & counsel, an underwriter or a program coordinator. Please include your contact details, any relevant file information, application reference number and whether you have a preferred method of communication. In some cases, we may ask you to put your concerns in writing, to ensure that we understand the full scope of your issue. If your initial complaint is not resolved to your satisfaction, please request that it be escalated to the department’s immediate supervisor or manager. If necessary, the matter can be further escalated to the relevant Department Head. Our ombudsman will launch his own investigation of the complaint and will advise you in writing of his conclusion. If you are a resident of Québec and are not satisfied with the outcome or with the examination of the complaint, you can at any time ask that your file be transferred to the Autorité des marchés financiers (AMF). Following the transfer, the AMF will examine the file and, if deemed appropriate, may offer dispute resolution services. Note that the filing of a complaint with the AMF does not interrupt the prescriptive period for civil remedies. While your constructive criticism goes a long way to helping us improve, we also invite you to share your compliments. Your positive feedback lets us know what we’re doing right and reinforces our strong commitment to you. If you have had a positive experience with a particular member of our staff we invite you to pass the information along so we can share the encouragement with our staff.